Cricut Maker Review: Is the new Cutting Machine Worth It?? A new Cricut machine is out! The Cricut Maker is 10x stronger and more precise than its predecessor the Explore Air 2. Talk about an impressive upgrade! But is the is the Cricut Maker worth it?? It is pretty expensive after all! This Cricut Vinyl Cutter is so incredibly versatile! It can cut even more material than the Explore. It has a uses a Rotary Blade that can cut sewing patterns for those wishing to work with fabric. This blade can be used on fabric without risk of tearing or fraying. For those who wish to cut really thick material, the Knife Blade can slice through material of up to 2.4mm thick!! WOAH!! Add in some truly clever features such as the Adaptive Tool System that automatically controls the blade direction and cutting pressure for you! So easy, so simple! AMAZON BEST SELLER: The Maker is on Amazon’s best seller cutting machine list. Check where it is ranking here. No wonder why everybody loves this cutter so much! Can’t wait to share this Cricut Maker review with you! Watch the short Maker Overview of the top features in this video below! The Maker is a truly unprecedented cutting machine. Its stand out feature is its ability to work with fabric without the need for backing, as such as this machine is perfect for sewing enthusiasts. We love its ability to offer clean precision cuts from the thinnest of silks to thicker material such as balsa wood. It offers 4kg worth of force and cut up to 2.4mm thick material (if you choose to purchase the knife blade additional). We are really impressed with this new cutter and we have been wow’ed by its plethora of features on offer! The cutter can slice through over 100+ materials! From thin fabric to thick balsa wood. It is lighting fast and offers beautiful precision cutting. We love love the adaptive tool system that automatically calculates your force according to the material you are using and we are so happy to see an extension on the ready-to-go projects that include some beautiful sewing patterns to cut out. This machine truly is revolutionary and comes at a truly affordable price tag. The Maker is an electronic cutting machine but it is also a fabulous fabric cutter. It comes included with software that will help you to create images that can then be drawn and cut out via the vinyl cutter on your choice of over 100+ materials. Just imagine the potential of those Cricut Projects that you can whip up! The key features of this cutter machine are that it has the ability to cut fabric (using the rotary blade) as well as thicker materials of up to 2.4mm in thickness (using the knife blade). Click here if you want to get an idea of what sort of fabric projects you can make with the Maker. We also have some inspiration of some felt fabric projects you can make with the maker here, and here is a list of the types of projects you can make beyond fabric. Below you will find our detailed review. I will outline the top features, specs, the pros, and cons of the Cricut Maker Cutting Machine. 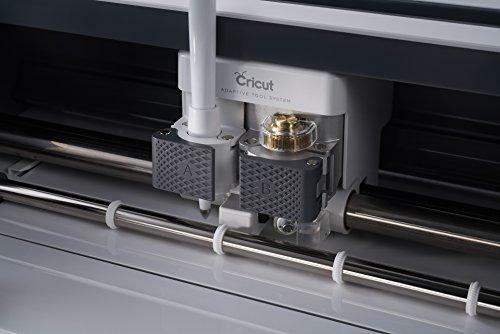 I will also give you suggestions of who this Cricut vinyl cutter would be perfect for; in order for you to help figure out if this machine is the right match for you! IS THE CRICUT MAKER CURRENTLY ON SALE? 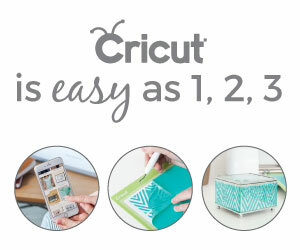 Check our Cricut Sale page to find any special deals on the Maker. The Maker offers a few upgrades and nifty features that will make it easy for even beginner crafters to use this machine. It is the newest Cricut Machine on the market and it sure is impressive! One of the main new exciting features of the Cricut Maker is its revolutionary ability to handle fabric really well. The Rotary Blade (one of the 6 blades that work with the Cricut Maker) has been designed to cut through virtually any fabric; without the need for backing, spray starch or Terial Magic. This nifty blade can handle a wide variety of material from stiff denim to fine silk. If you love working with thicker material, you might want to look into investing in the new cool Knife Blade (Grab the Knife Blade here). This blade can cut extra deep and ensures precision cutting up to 2.4mm (3/32″). 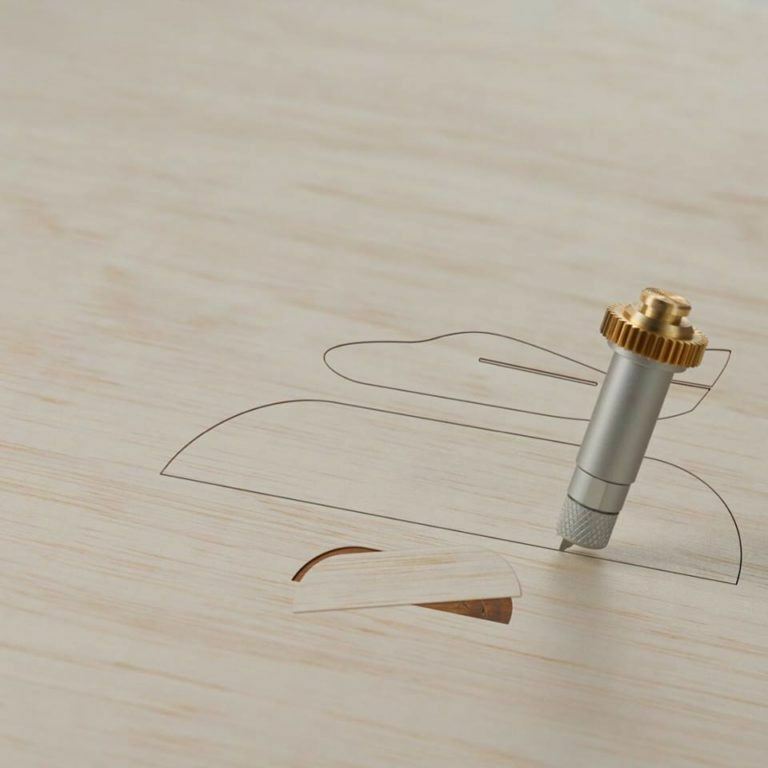 This means that you can now create clean precision cuts on thick material such as leather and balsa wood. This feature truly takes this personal vinyl cutting machine up to the same levels as some of the more expensive professional machines. For those who loved the smart dial on the Cricut Explore Air 2, you might be sad to know that the dial has disappeared. However, we are in love with the Adaptable Tool System and think it is the best feature yet. It adjusts the direction of the blade as well as the pressure to match the material you’re using. No more setting the dial to the material you are using, this machine is so bloody clever that it can work with the grain of balsa, the warp, and weft of fabric and the specifications of other materials to preserve the crispness of the lines. The Maker allows you to keep two tools locked and loaded at once. It means that you can easily switch between your favorite tools and simply makes life so much easier. You can choose between a pen tool to create phrases; a washable fabric pen to use for your sewing patterns and a calligraphy pen. You might also enjoy the scoring stylus for all those folded paper crafts. As you know, a big feature of this cutting machine is its ability to cut fabric. 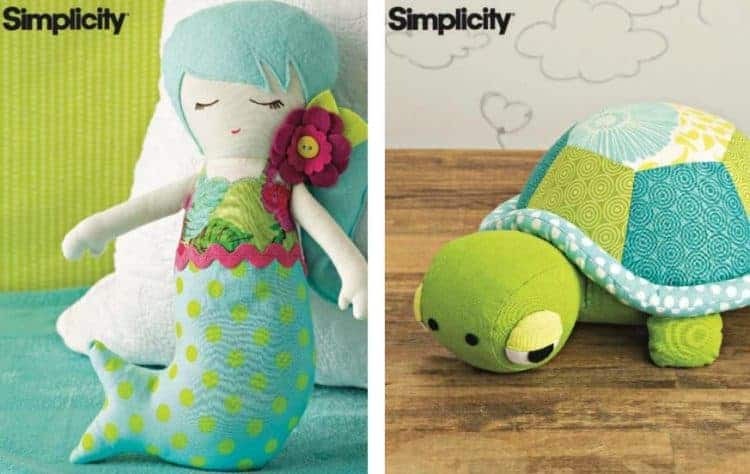 To make this feature even more pronounced, Cricut has teamed up with Simplicity patterns and Riley Blake Designs to bring you ready-to-make projects that come free with the Cricut Maker. This truly simplifies sewing and quilting projects and will save you loads of time; plus it takes away the boring job of hand cutting your panels for your projects. Simply choose a digital sewing pattern, and let the Cricut Maker cut and mark all the pieces – you just sew them together! So easy! Want to work with some unique pens? This machine can make coloring pages, write beautiful card sentiments and prepare decor items. Use the Fine Point Pen for your lettering or to draw acid-free, water-based drawings. Use the Washable Fabric Pens to make some markings on your sewing patterns. Or try out the Calligraphy pen for some fancy writing. This new Cricut Maker is a great machine for those who wish to work with a wide range of materials. It has the ability to cut over 100 materials; from thin vinyl to thick leather, metal, foam, and fabric (including silk, chiffon, denim, and canvas). Find a full list of the materials it can cut here. A top difference between the Cricut Maker vs Cricut Explore Air 2 is that the Maker can handle fabric & thicker materials really well (although you will need to purchase the Knife Blade additionally for thicker materials)! The Cricut Maker max cut size is 12″ wide x 24″ long. This is a pretty standard size for a personal vinyl cutting machine and will be sufficient for most craft enthusiasts. It comes with two cutting mats; a FabricGrip Mat 12″ x 12″ and LightGrip Mat 12″ x 12′. What Material Thickness can the Cricut Maker Cut? We love the flexibility of the cutting thickness of the Maker. The Cricut Maker has a cutting force of up to 4kg. If you purchase the additional knife blade, this nifty machine can cut materials up to 2.4 mm thick. This extra-deep blade slices through heavier materials like balsa wood and matboard! Your Cricut Machine comes with a 1-year warranty. You will also have access to their Help Centre, their ‘How-To’ tutorials as well as videos on how to set up the Cricut craft cutter properly. The Cricut Maker is available in three beautiful and elegant colors. 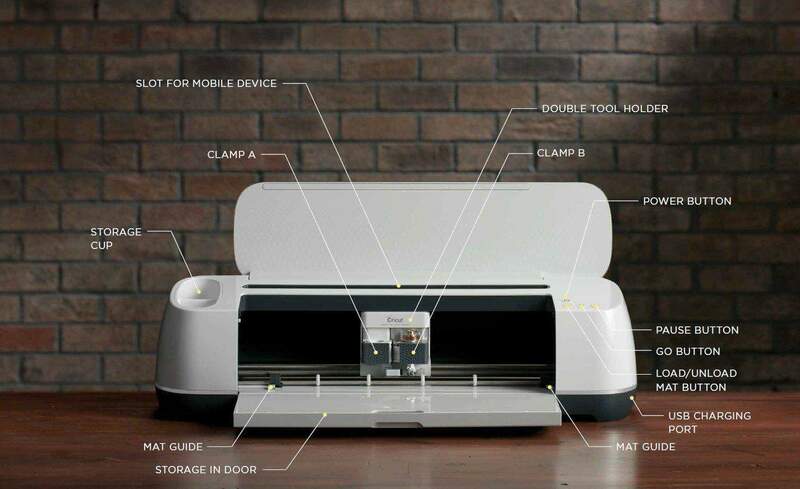 Below you will find our Maker Cricut machine review; focusing on the pros and cons of this machine together with information on who this machine would be perfect for. We love that the Fast Mode enables you to cut and/or write up to 2x faster without losing precision. This is the machine for you if you are after super intricate designs. Simply switch the Maker to precision mode (which is a bit slower than fast mode) and it will deliver superior intricate cuts! This machine’s remarkable ability to handle over 100 materials is definitely impressive! It is also our top choice machine when it comes to working with thicker materials and fabrics. The docking station is a really great addition. Simply dock your tablet or phone right onto the Maker. It even has a USB port for phone and tablet charging. Perfect for when you are watching video tutorials! Of course, because the machine has wireless functionality, you can also create your design on the comfy couch and simply send it to the machine when you are ready. One of the biggest selling points about this machine is that it is our the recommended vinyl cutter for fabric. 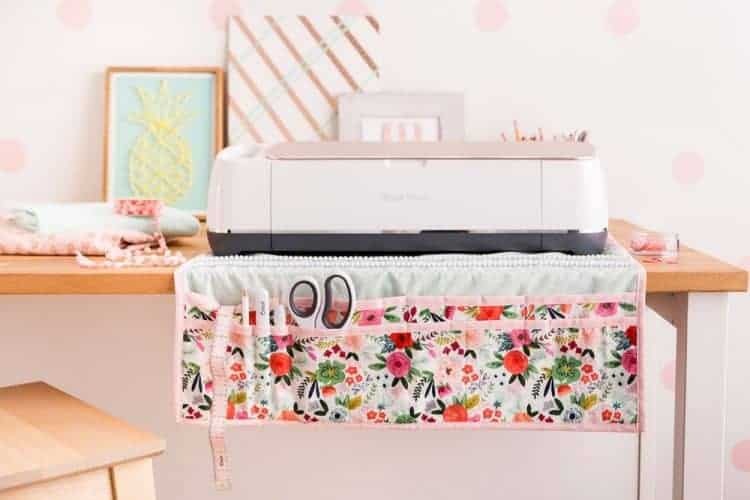 Cricut has really fine-tuned this feature and we love that it can create superior cuts from sewing patterns. It is, in fact, the only hobbyist vinyl cutter that we would recommend for fabric as the other machines such as the Cameo 3 and Explore Air 2 struggle to produce a clean cut. This cutter is flexible in how you wish to attack your projects. For those that love to stick to easy ready-to-go projects, you can make use of the 50 free projects and 25 sewing patterns that come with the Cricut Maker. And for those who are more proficient and love to do their own thing, you will be happy to know that you can use your own images and fonts, using a variety of different file formats. Simply migrate designs from Photoshop, Illustrator or other programs. I really have a pet peeve with companies who advertise that a machine can do something, only to realize that in order to do it you have to spend more money! The maximum cutting area of the Explore machines is 12″ wide by 24″ long. As this machine is a halfway stepping stone between hobbyist and professional vinyl cutters, we really would have loved to see a larger cutting space. It is still a really decent cutting length, but it would have been nice to have a larger area altogether. 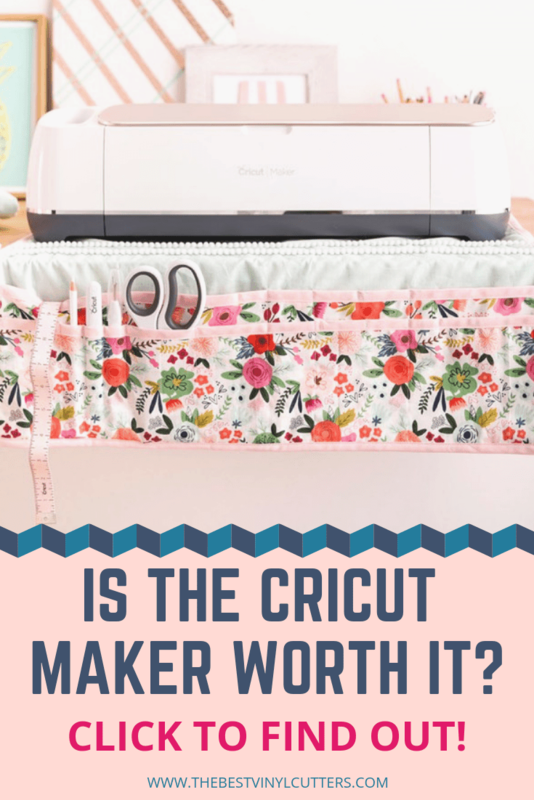 So back to our question – is Cricut Maker worth it? 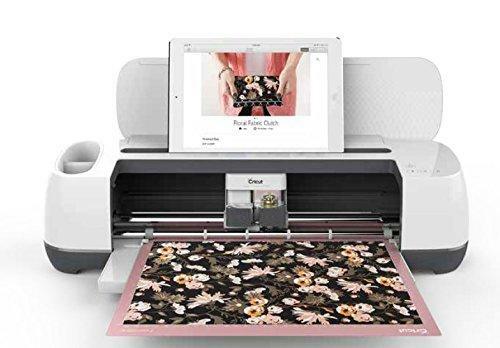 Whilst the Maker is more pricey in comparison to other machines, the Maker Cricut Machine is without a doubt one of the best vinyl cutters for both fabrics as well as for thicker material. We love that this machine is so versatile that it can handle material from the gossamer-thin fabrics and tissue paper to balsa wood & leather. This machine excels in offering top-notch features and specs. 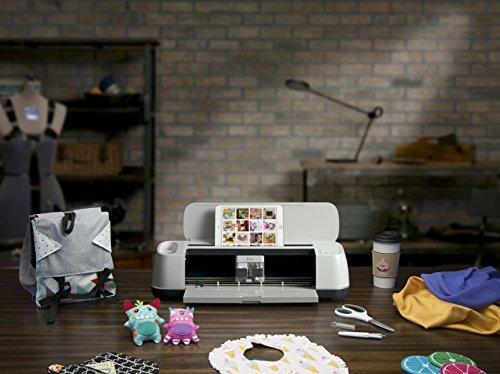 With lightning-fast precision cutting capabilities, its reasonable price tag as well as its promise to fit with all past, present and future Cricut tools, you know that this machine will last you for many years to come! We are head-over-heels in love with this cutter and we know you will love it too. You can click here to find the current best deals. You can always typically save a lot of money by grabbing one of the popular Cricut Maker Bundle Deals. And we have also listed some great tools and accessories that go well with the machine down below. If you are after some great bundle deals to save you money, please scroll down to our deals and accessories below! 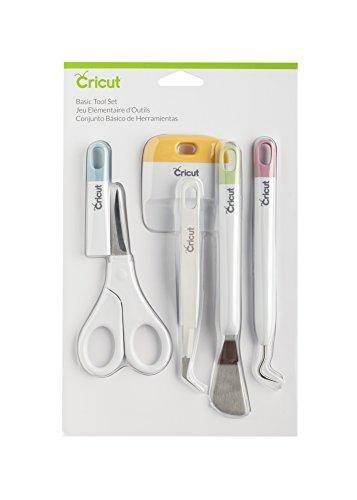 You can read through all the positive Cricut Maker reviews on Amazon here, or simply click the button below to grab your cutter now. Find below a selection of tools, supplies, and bundles that are worthwhile to invest in. 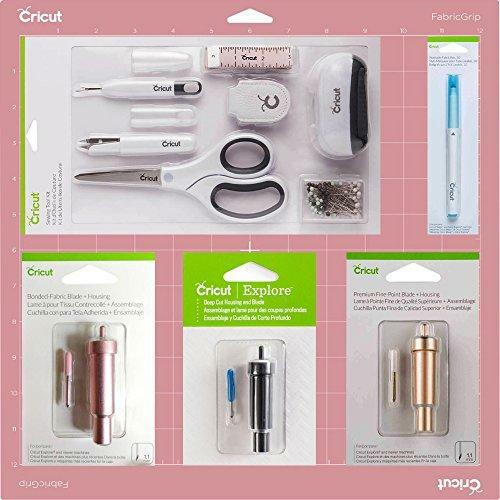 The Cricut Maker Essentials Tool Collection set is a great accompaniment to the Maker machine. It features the perfect variety of blades, mat, and sewing tools. >>> CHECK OUT THIS DEAL ON AMAZON NOW! Save money by purchasing this popular Cricut Maker Beginner Bundle Deal. Grab all the handy tools in one handy set! Includes the following tools: Scissors with protective blade cover; Tweezers; Weeder; Scraper; and Spatula. Did you find our Cricut Maker machine review helpful? 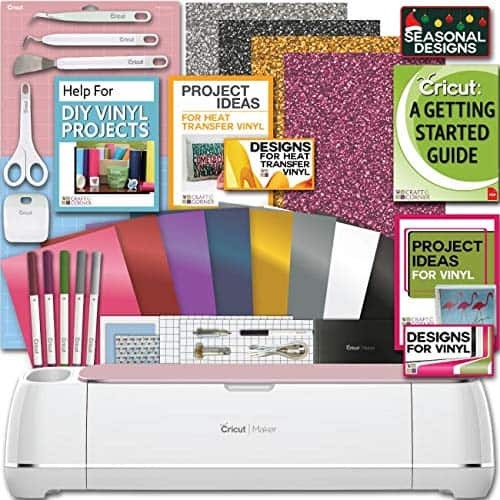 Will you be purchasing a Cricut Maker vinyl cutting machine? In your opinion, is the Cricut Maker worth the money? Thank you for this wonderful review. I was searching for a die cutting machine that would cut out patterns for women’s clothing. I am disappointed that this machine only has a 12 in width, a major drawback. That seems a little narrow for laying out an adult size clothing pattern. Most if my sewing is with stretch knits. I feel that my needs are not met with this machine or any other die cutting machine for the home sewer. I wonder how long it will take for technology to catch up to cutting out full size patterns? When you consider the new 3D printing technology that is coming out, we can assume these die cutters will also get better. Until these die cutters can make a quantum leap I’ll wait. Your review has really helped me make a decision. There are so many of these machines and yet none of them fit my needs. Thank you again for such an excellent review! Hi Shelley, yes, whilst this is a lovely step in the right direction for those that want to cut fabric – it is simply just not suitable for adults clothes. Great for quilters, those making clothes for kids or other items such as bags etc. I’m sure that before long a new machine will come around that will surprise us with yet another massive leap, but for now you will need to hand cut those panels 😉 Thanks for your comment and feedback.